iOS 4.2 GM (Gold Master) for iPad, iPhone and iPod Touch is now released by Apple. The iOS 4.2 GM build is 8C134 and download is avialable to members only from iOS Dev Center. 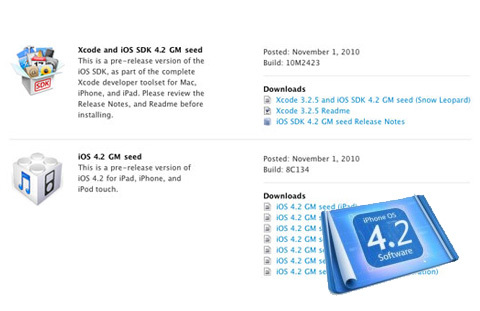 Today Apple released to developers the GM seed for 4.2. Tinkerers will find that yesterday’s redsn0w jailbreaks today’s 4.2 GM seed, simply by pointing redsn0w at the 4.1 IPSW (rather than the 4.2 one). Right now it mostly only makes sense for JB app developers to do that because many apps (including Cydia itself) need to be updated for 4.2. However, if all you want to do is enable afc2 (to use iFunBox or other file browsers), or to tweak settings like Battery % and Homescreen wallpapers, then go for it (if you have valid paid access to the GM seed). Be sure to uncheck the Cydia box, though! Ultrasn0w unlockers should stay very far away from this!! If you want to stay updated with more news on iOS 4.2 GM just subscribe to our RSS Feeds. Download iOS 4.2 GM for iPhone, iPad, iPod touch and SDK from iOS Dev Center.